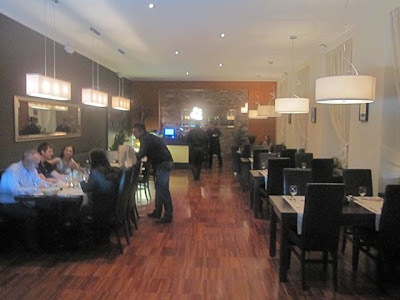 Almost 10 years ago, I used to go regularly to Kogo for my fix of Italian/Mediterranean food. But it got too expensive. 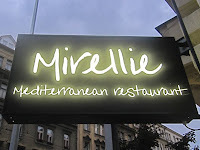 A couple of years ago, I discovered, Mirellie in Dejvice. Founded by Kogo castaways, it boasted essentially the same menu and almost the same quality for almost half Kogo's prices. But it was too far away to go regularly. I live on the other side of town. 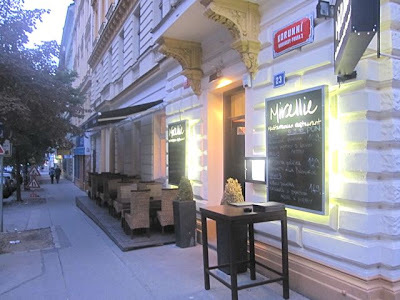 So I was quite pleased when I saw that Mirellie Vinohrady opened recently, not far from Náměstí Míru. The immediate question: would the second outlet maintain the quality of the first? I went solo on my first visit. 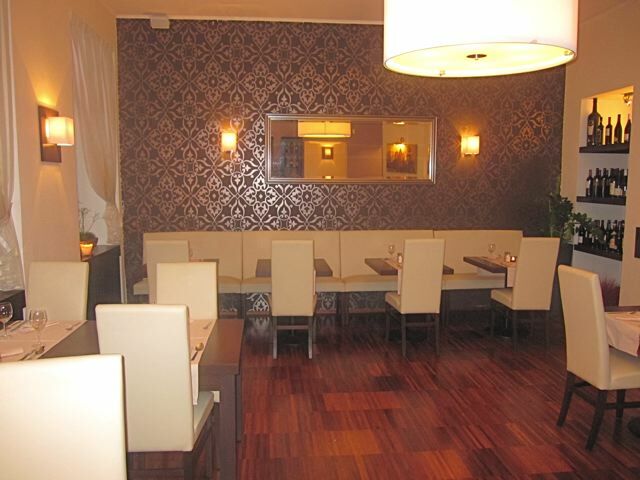 The larger of the two dining areas is for smokers. It's a smart-looking space, with a beautiful stained-wood floor, modern, comfortable furniture, and big, round light fixtures. It's essentially the same design as in Dejvice. The non-smoking area has lighter colors and feels cozier. Sometimes non-smokers get second class treatment in this country, but I liked this smaller room better, and it is completely separate from the smoking area. The music was at a good level, with some soulful ballads and brassy R&B. 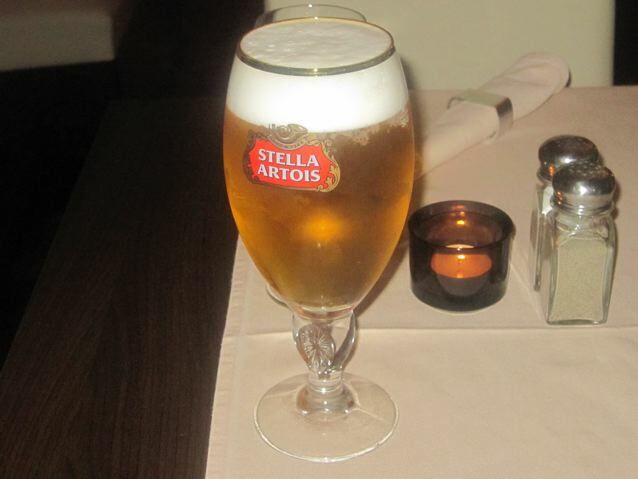 I began with a half-liter of Stella Artois (45 CZK). I prefer other brands, but it was cold and fresh. 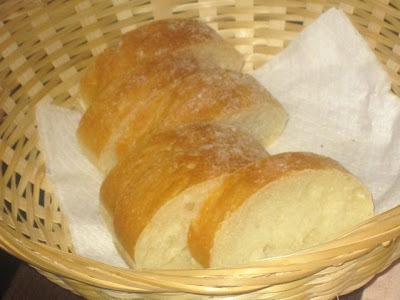 The waiter brought sliced bread in a basket. There is a 10 CZK charge for this. It's served cold, and not bad, but nothing special. For a starter, I ordered the grilled octopus with beans and leek (185 CZK). Very good. 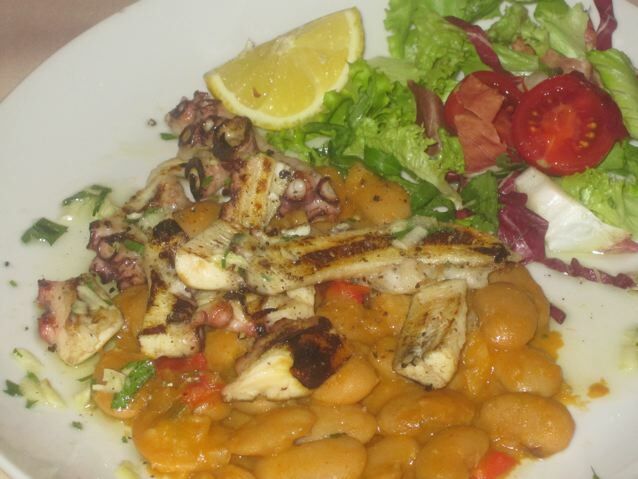 There was a generous portion of tender, charred tentacles. I savored the smoky flavor and crunchy/soft texture. Together with the salty, tangy, creamy beans, this is Mediterranean comfort food at its best. It's similar to the much-loved version served at Giardino Enoteca con Cucina. 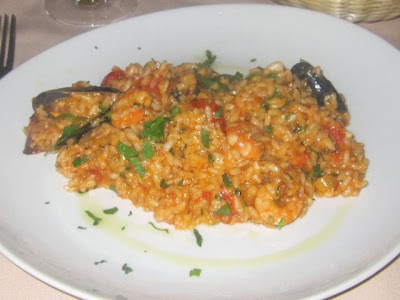 For my main course, I had the risotto alla pescatore (190 CZK). It's a good point of comparison, I almost always ordered it at Kogo and also at Mirellie in Dejvice. When done well, it's one of my favorite dishes. This one was perhaps slightly better than the one I had at the first Mirellie. The rice was al dente, as it should be. It was stocked with many small, fresh, but overcooked shrimp. There were also mussels, little clams, small, unsliced calamari, cooked cherry tomato, and leaf parsley. I thought it could use some wine in there. I added salt and lemon to suit my own tastes. That said, I found it delicious and satisfying at a bargain price. An interesting note. 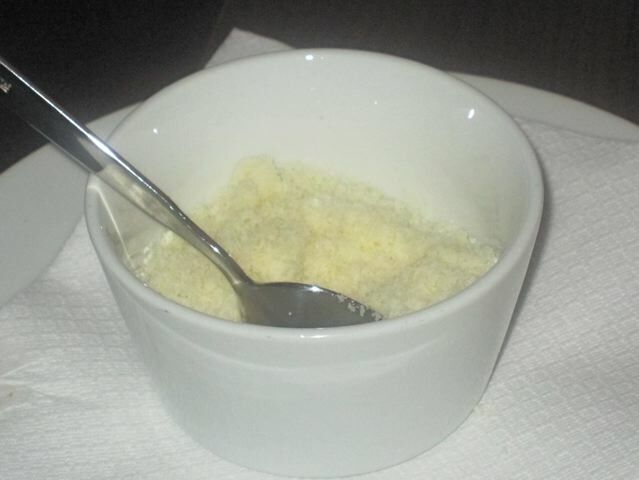 The dish was served with a bowl of Parmesan cheese on the side. 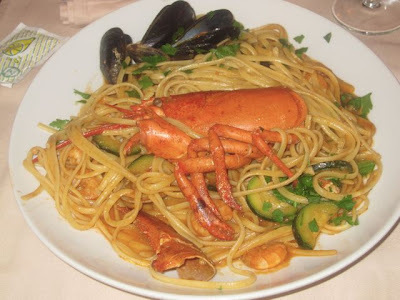 Many Italians consider putting cheese on seafood to be heresy (and at least one Italian restaurateur told me so directly). They say it works against the delicate flavor of the seafood. But rules are meant to be broken, and I'll add it if I feel like having that flavor in there. I asked the waiter which of the desserts were made in-house. He said there was only one, a homemade "chocolate cake" (75 CZK). He said it is a regional specialty of the former Yugoslavia. What I received certainly looked homemade. Syrupy chocolate covered two layers. But it wasn't cake-like at all. 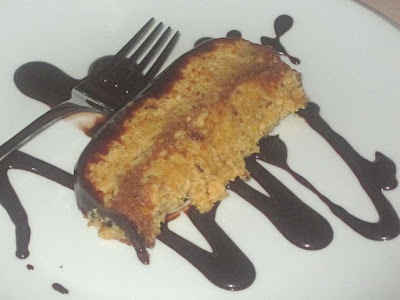 It was very heavy, gooey, sugary and was studded with what tasted like chopped peanuts. The waiter told me it was also made with caramel. I don't want to appear insensitive to the cuisines and tastes of other cultures, but I really didn't like it. It took my understanding of cloying to a new level. And I have a big sweet tooth. 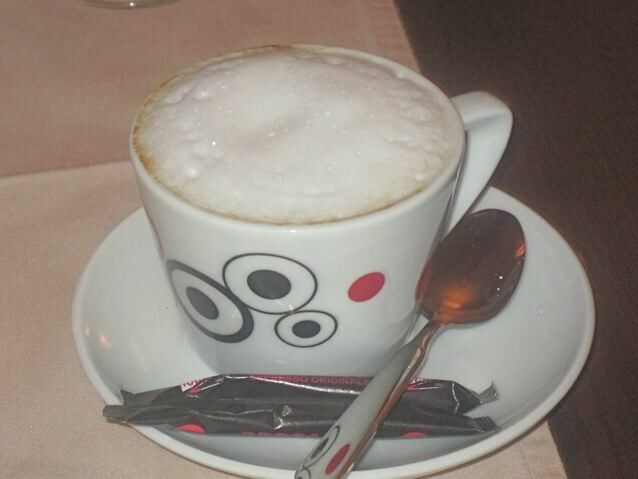 I had a cappuccino to pull my taste buds back down to earth (50 CZK). Unusually for me, I didn't add sugar. But I found the coffee to be on the bitter side. The service throughout the meal was excellent -- efficient and very professional. 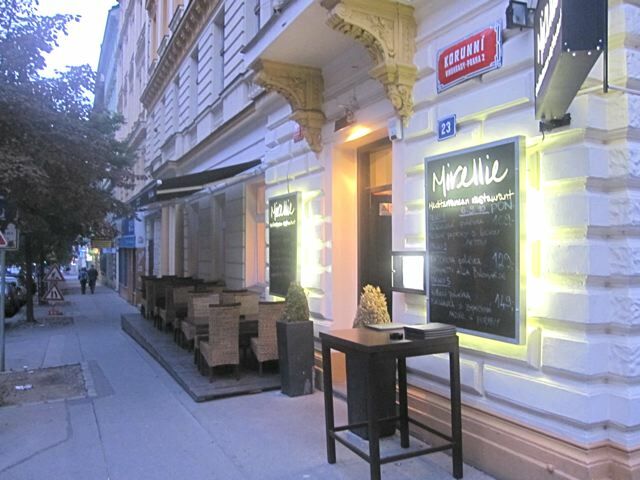 The bill for three courses, beer, and coffee was 555 CZK without tip. Great deal, I'd say. I went back the very next evening with Jersey Girl and SS. I thought it appropriate because Jersey Girl was present for my review of Mirellie in Dejvice. We sat in the same area I was in the night before. This time, the music was Tom Jones and what sounded like 80s pop. Later, it thankfully switched to Barry White. 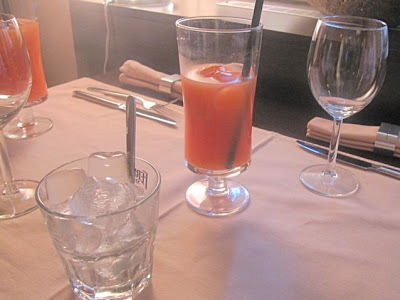 The ladies were drinking Campari and orange juice (115 CZK each). 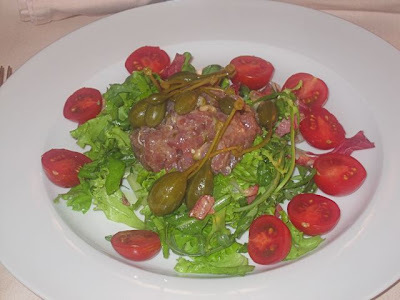 I started with tuna tartare (180 CZK). 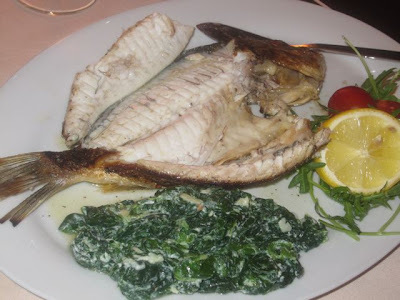 The fresh, chopped fish was dressed with lemon, olive oil, and chopped capers. I'm not a big caper fan, but having a hint of it in the mix really worked for me. 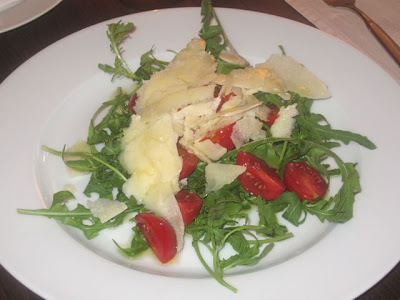 SS had the rucola salad with cherry tomato and Parmesan (145 CZK). She said the rucola had a great, peppery flavor. She added that many leaves had thick, inedible stems that she had to remove. The shaved cheese was top quality. But this dish seemed too expensive for what you get. 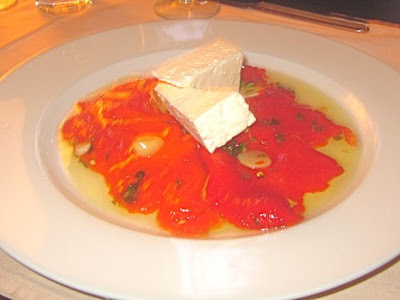 Jersey Girl had the roasted red peppers with Feta cheese (125 CZK). The peppers were lightly vinegared and heavily olive oiled. I liked them, but Jersey Girl thought they were too sweet. We both agreed that the cheese was rather pedestrian and way too salty. 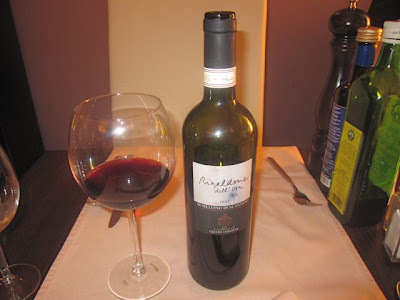 But on this visit, Jersey Girl picked the Morellino di Scansano (460 CZK). 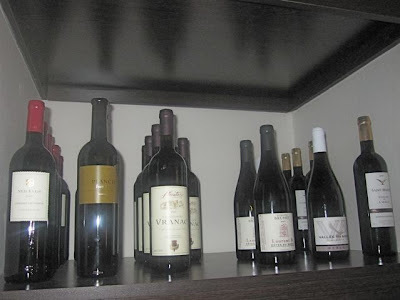 We all liked this dry red. It smelled great. 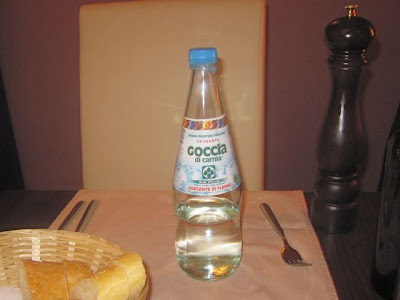 We also shared a big bottle of Italian mineral water (85 CZK). I'll note here that I had the same brand and size of water at Restaurant U Emy Destinnové last week, and I was charged 150 CZK -- one of the few cases were the prices there were out of whack. 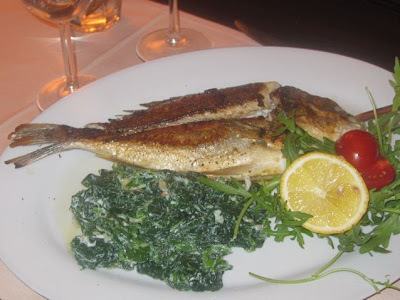 For a main course, Jersey Girl got the grilled dorada (295 CZK). She loved it. And they did something she had never seen before. The whole, grilled fish was deboned before being brought to the table, and then put back together. She really appreciated that nice touch. She felt that the spinach on the side was too salty, but I thought it was acceptable. 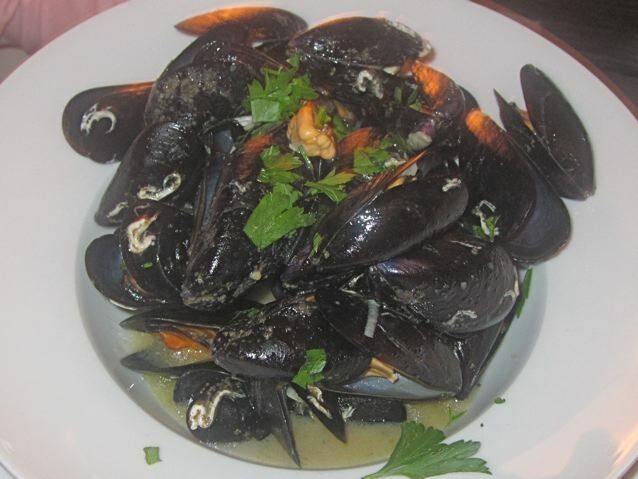 SS had the mussels in white wine (195 CZK). The meat inside the shells was very tender. She liked them and thought they were fresh. They tasted slightly too fishy to me. I ordered the linguine with lobster (285 CZK). 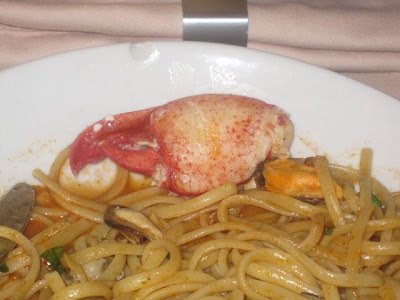 When I order lobster and the price is this low, I don't expect much meat. But what I got was all shell and no meat. I stopped the waiter and showed him the empty shells. He was profusely apologetic and promised a quick remedy. Within about five minutes, another waiter brought me a cooked piece of claw meat. Even so, the dish was just OK. The sauce was mostly salty, with a hint of the sea. Some mussels, shrimp, and clams were thrown in along with zucchini and fresh parsley. 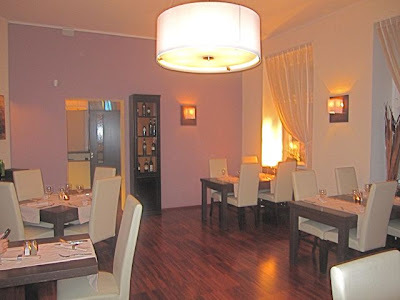 The bill for this dinner for three, with wine, drinks, water, and two espressos was 2200 CZK. Again, I thought it a good price. Not every dish succeeds But there are some real winners at excellent prices. There's definitely value for money, along with a good atmosphere. So my verdict is that Mirellie in Vinohrady is virtually identical to Mirellie in Dejvice. And that is something to be happy about. They've got a great lunch menu too; by far the best risotto deal in town! Too right about Kogo; WAY too expensive now for my tastes; Mirellie really is the business, at a reasonable price. 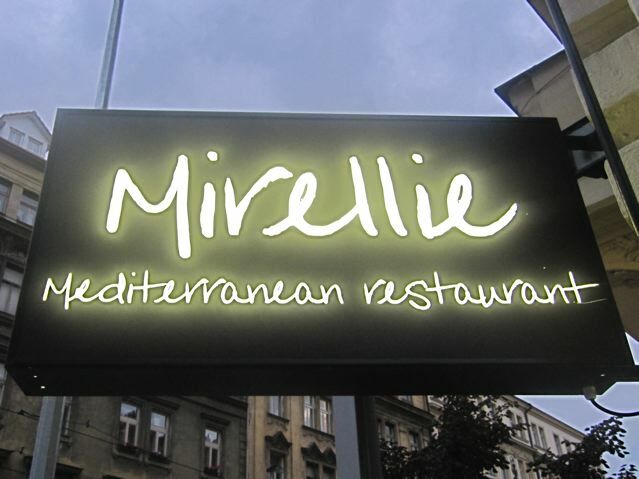 Unfortunately, we went to Mirellie on Friday night, and had the worst meal of our two years in Prague. Bruschetta made with untoasted Czech bread, feta which wasn't feta, steak served in burger dressing, cold gristly osso bucco - nothing was right. Expensive, bad service and disastrous food. Very unhappy!